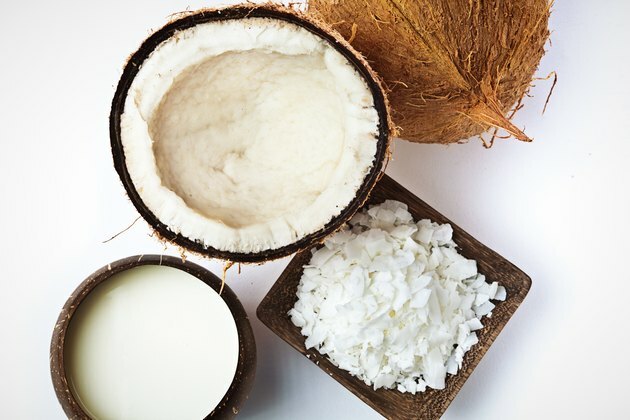 What Are the Advantages of Coconut Milk Vs. Dairy Milk? Everyone is familiar with cow's milk and likely grew up drinking it. However, if you're allergic to milk, have lactose intolerance, eat a vegan or paleo diet or just don't like the taste of milk, you may want to consider the benefits of coconut milk. Coconut milk compared to milk shows some nutritional differences, but both offer healthy advantages depending on your individual circumstances. Coconut milk is different from coconut water. It's not the liquid contained in a raw coconut, but a product made by grating the meat found inside, blending it with hot water and then straining and filtering the mixture. Although vitamin D, and sometimes vitamin A, are added to dairy milk, many brands of coconut milk marketed as a drink have added vitamins and sugar to make the product more comparable to milk. For the purpose of comparison, we'll look at raw unsweetened coconut milk and whole dairy milk. Protein is essential for the maintenance of muscles, bones, cartilage, skin and blood in your body. Milk contains almost twice the protein of coconut milk. One cup of milk has 7.7 grams (g) and one cup of coconut milk has 4.6 g, according to MyFoodData. One cup of milk supplies 15 percent of your daily recommended value for protein. If you're counting calories, a cup of coconut milk will contribute a whopping 445 calories, compared to 149 in milk. You needn't worry about drinking coconut milk if you're concerned about your cholesterol level — coconut milk has none, while milk contains 24 g, or 8 percent DV per cup. Coconut milk contains half as many carbohydrates as milk, which may be a benefit if you're on a low-carb diet. Raw coconut milk has no sugar, while whole milk has a high sugar content of 12 g. Be aware that sugar is often added to flavored coconut milk. Check the label. When it comes to vitamins, milk is the winner with its vitamin A content of 395 IU, offering 13 percent DV per cup; coconut milk has none. Milk is a good source of vitamin B12, thiamin, riboflavin, beta carotene and vitamin K; coconut milk has none of those vitamins. However, the MyFoodData list shows that coconut milk has 3 percent DV for vitamin C, whereas milk has none, and coconut milk has more niacin than milk does. While milk can offer more benefit for your heart, muscles and nerves in the calcium it contains, the combination with milk's vitamin D may have the additional benefit of protecting against cancer, diabetes and high blood pressure, according to Mayo Clinic. One cup of milk supplies 275.7 mg of calcium, or 21 percent DV. Meanwhile, there is only 40.7 mg of calcium in coconut milk, or 3 percent DV. That's seven times more calcium in milk than in coconut milk. Milk supplies 16 percent DV for vitamin D, or 3.2 mcg. There is no vitamin D in coconut milk. Both coconut milk and dairy milk are nutritious in their mineral content. Milk is superior in its potassium, phosphorus and selenium content. Coconut milk supplies four times more toward the DV of magnesium compared to milk. Coconut milk also boasts a notable difference in its manganese content — 75 percent DV — as compared to milk, which has none. Coconut milk supplies 41 percent DV per cup for iron; milk has none. Coconut milk also provides over eight times the DV for copper than milk does. The sodium content in milk delivers 4 percent recommended daily value; coconut milk supplies 1 percent. Approximately 65 percent of the population has a reduced ability to digest lactose, according to NIH Genetics Home Reference. Lactose intolerance is an impaired ability to digest lactose, a sugar found in milk. Coconut milk does not have lactose, so products like So Delicious Organic Unsweetened Coconut Milk have become a popular substitute for dairy milk for people who have an intolerance or milk allergies. However, coconut milk can also cause allergies because coconuts is a tree nut. In extreme cases, drinking coconut milk could be fatal if you have a tree nut allergy, according to Health24. Whole milk has 7.9 g of fat of which 4.6 g are saturated; coconut milk has 48 g of fat, with 43 g saturated, according to MyFoodData. This amount of fat in coconut milk sounds like a lot, but it's in the form of medium-chain fats. Medium-chain triglycerides are absorbed more quickly by the body than some other fats and quickly metabolize for energy. They're not stored in your fat cells. You might assume that the fat content in coconut milk is bad for your heart, but the opposite may be true. Coconut milk may help lower cholesterol levels and prevent heart attacks. A study, published in the Journal of the American College of Nutrition in 2017 concluded that medium-chain fatty acids, found in coconuts, were actually beneficial to the heart because they have an effect in reducing cholesterol levels. According to Healthline, fats are responsible for about 93 percent of the calories in coconut milk. Of these fats, more than 50 percent are MCTs. In comparison, only 10 to 12 percent of fats in dairy milk are MCTs. Does Milk Raise Cholesterol Levels?